Cardioversion is a corrective procedure administered chemically or electrically to convert an abnormal heart rhythm into a normalized heartbeat rhythm. Most non-emergency Cardioversions are performed to treat atrial fibrillation or atrial flutter – both are non-life threatening abnormal rhythms in the top portion of the patient’s heart. When Cardioversion or Defibrillation is used in an emergency, it is to correct an abnormal rhythm accompanied by low blood pressure, faintness, difficulty breathing, chest pain, or loss of consciousness. Elective Cardioversion is used to treat arrhythmias such as irregular heartbeat or heart rhythms that are too fast or too slow. 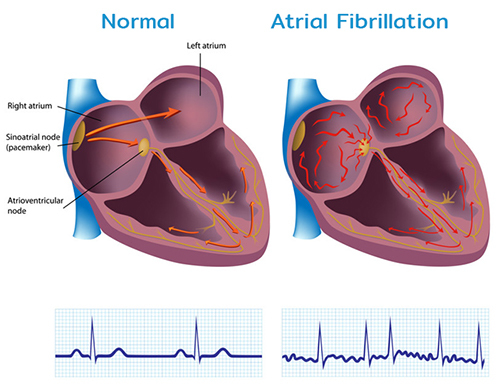 Atrial fibrillation (also called AFib or AF) is a quivering or irregular heartbeat (arrhythmia) that can lead to blood clots, stroke, heart failure and other heart-related complications. Many people who have atrial fibrillation don’t notice any changes in the way they feel, but at least 2.7 million Americans are already living with AFib. Cardioversion can also help to treat other kinds of abnormal heartbeats such as atrial flutter, atrial tachycardia, and ventricular tachycardia. During Chemical Cardioversion, anti-arrhythmic medications are administered to restore the heart’s normal rhythm. Anti-arrhythmic medications work by altering the flow of electricity through the heart. 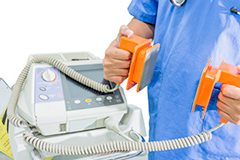 Chemical Cardioversion may be performed in the hospital under monitoring or as an outpatient visit – depending on the severity of symptoms and underlying causes of the heart condition. Electrical Cardioversion is a procedure in which paddles or electrodes are used to deliver an electrical current through the chest to the heart. It is also referred to as DC or direct-current Cardioversion. The expected outcome of the treatment is disruption of the abnormal electrical current within the heart in order to reset the heart back into a normal rhythm. Electrical Cardioversion is performed in a hospital setting where the patient’s blood pressure, oxygen levels, and heart rhythm can be carefully monitored. Prior to your Cardioversion, there is minimal special preparation such as some fasting, as you will be asked to not eat or drink anything for at least 8 hours prior to the procedure. Bring a list of your current medications and dosages, or simply bring your medicine containers with you. Continue taking your prescribed medications as required. For patients who have had AFib presenting in excess of 48 hours, their blood must be adequately thinned for at least 3 to 4 weeks prior to the procedure to help prevent blood clots and reduce the potential for stroke. The blood thinners – or anticoagulant medications – may need to be continued for at least 4 weeks after the Cardioversion. If you have any questions, be sure to ask them prior to the procedure. On the day of your test, wear comfortable clothing and remove earrings, hairpins, and necklaces. You may also be asked to remove any jewelry from your arms, and wrists. Avoid applying any lotions, creams, or powders that day as they can prevent the paddles or electrodes from making proper contact with the skin. During Cardioversion, an intravenous line will be placed in your arm to provide a mild sedative to help you relax and may make you sleepy. There is no pain during the procedure and in most cases, you will wake up quickly and not remember the shock. Your Cardiologist will discuss with you whether you may require further treatment or if you need to be prescribed an anti-arrhythmic medication to maintain a normal heart rhythm. Unless further medical treatment is required right away, you may go home after the procedure. The process takes approximately 30 minutes. Have a friend or loved one pick you up, or another source of transportation, as you may not be capable of driving properly due to some medicines used to help you relax. Once you are home, rest as much a possible, as fatigue may be a symptom for awhile after the procedure. Test results will be studied carefully to establish whether any previous medical treatment has been effective, and used as a guide when determining if other treatment measures need to be implemented. Treatments for heart disease include making heart-healthy lifestyle changes, some prescribed medicines, and medical procedures as necessary. Treatment goals are to prevent you from having a heart attack and to stop the disease from becoming worse. Your individual treatment depends on how severe the disease is, your symptoms, as well as your age and overall level of health. 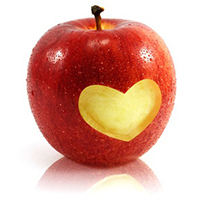 Prevention is always the best option, so we strongly endorse focusing on your heart health to stop or decrease the chance of developing a heart condition. Advice shall be provided about lifestyle changes which can include following a heart-healthy diet, quitting smoking, limiting alcohol intake, and exercising regularly. Major risk factors include having unhealthy blood cholesterol levels, high blood pressure, diabetes, and being overweight or obese. A lack of physical activity or a sedentary lifestyle can worsen these risk factors for heart disease. At South Strand Cardiology we focus on prevention as well as treatment. Patient education and the implementation of beneficial lifestyle changes are absolutely necessary in preventing clinical disease and premature death. It is true that “an ounce of prevention is worth a pound of cure”. Copyright ©2018 South Strand Cardiology, LLC. All Rights Reserved. | Web Design by GINGALLEY.